Leading architectural historian Watters looks at the history of a troubled and celebrated structure that emerged out of an innovative phase of post-war Catholic churchbuilding. 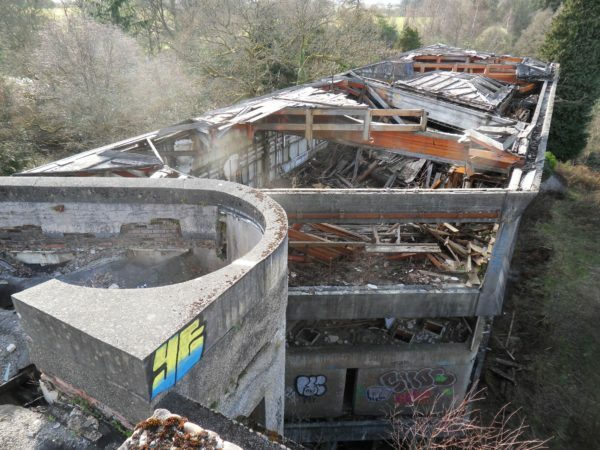 The story of Cardross Seminary began in 1946 and since then, as Watters and the accompanying photography shows, it has undergone many phases from birth, to death, and now innovative renewal. The story of Cardross Seminary begins in 1946, when St Peter’s College in Bearsden was destroyed by fire, and the college moved elsewhere: first, in 1946, to Darleith House, and then additionally, in 1948, to Kilmahew House, Cardross. It was not until 1953 that the concept of a new and massive extension to Kilmahew House, to be designed by the architects Gillespie, Kidd & Coia, was formally endorsed; and building work did not start until 1961. The new seminary that was eventually opened in November 1966, although not completed until 1968, was a large and strikingly Modern design, but was at the same time not without its traditional, even anachronistic, aspects. 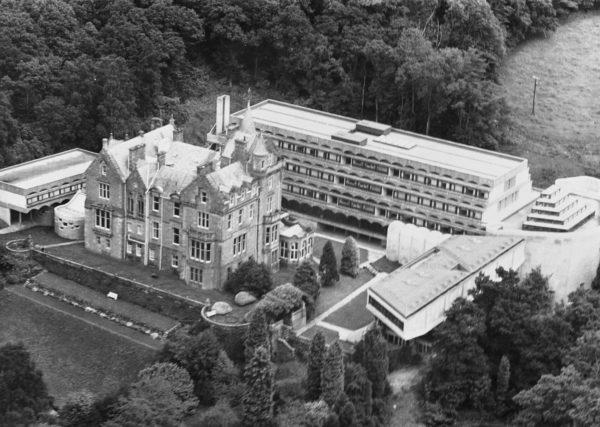 Located on a limited, level area set in steeply sloping woodland, the new seminary buildings were grouped in a courtyard or precinct-like manner on three sides of Kilmahew House. This Scotch Baronial mansion was originally built in 1865–8 to the designs of John Burnet the elder, for John William Burns, son of the founder of the trans-Atlantic Cunard Line. Kilmahew was a compact, tower-like design in the tradition established by J Gillespie Graham at Brodick (1844) and Ayton (1851), with a massive arched porch similar to Burnet’s Arden House (1867). 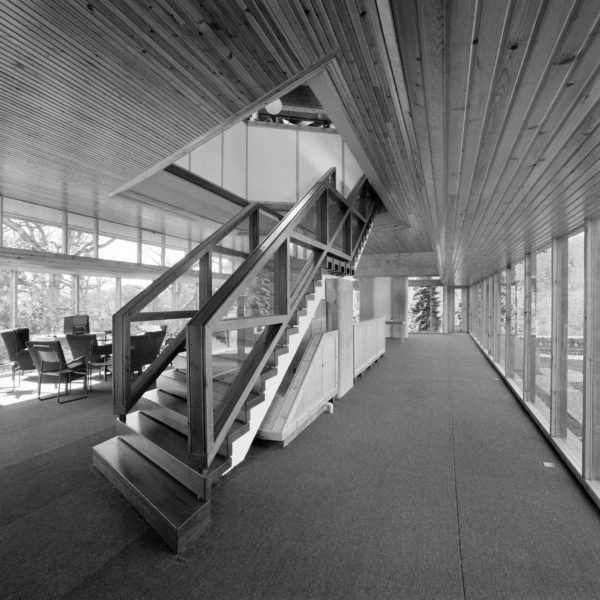 During the 1959–66 work, this mansion was thoroughly refurbished. Gillespie, Kidd & Coia’s new buildings included the main five-storey accommodation block, with bedrooms on the upper floors and the communal spaces of refectory and chapel below; a projecting two-storey wing at one end of the chapel contained a sanctuary and crypt beneath. To the west of the main block, a common-room and classroom block dramatically jutted out over the woodland, while on the north side of Kilmahew House was placed a small, self-contained group of convent buildings. Architecturally, the Gillespie, Kidd & Coia buildings, grouped into varied external forms and internal spaces, and faced mainly in rough harling and concrete, belonged to the late phase of the Modern Movement – a period, from the late 1950s to the early 1970s, when the simple, crusading faiths of the Modern pioneers were challenged by calls for more complex solutions. The extended Cardross Seminary only functioned as intended for a few years. 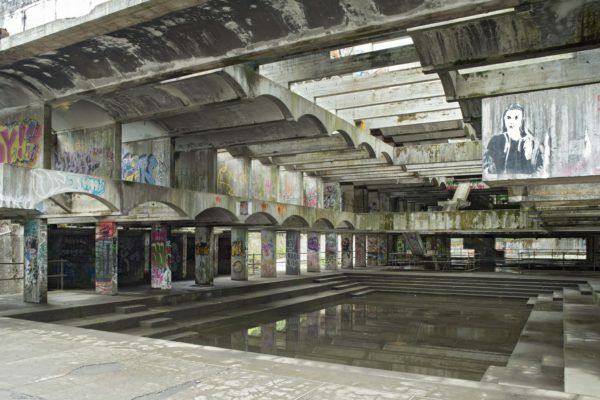 It closed in 1980, within fourteen years of its opening, and began its long decline into decay and, ultimately, ruin: the abandoned complex had only one period of active occupation, as a drug rehabilitation centre from 1983 to 1987. In 1995, Kilmahew House was gutted by fire and demolished, leaving the Gillespie, Kidd & Coia additions standing on their own. Over the 30 years since its closure there ensued a long succession of plans for re-use or repair of the derelict complex, and from the mid 1990s, an equally protracted battle by preservationists to save and restore it. The decaying ruin of the former seminary itself sat patiently awaiting its fate throughout. In 2015, a part-restoration scheme for its re-use as a cultural centre, developed by new owners, the public arts-charity NVA, began work on site. The staging of the art event Hinterland, in March 2016, officially opened the former seminary buildings to the general public. The restoration scheme is due for completion in spring 2019. 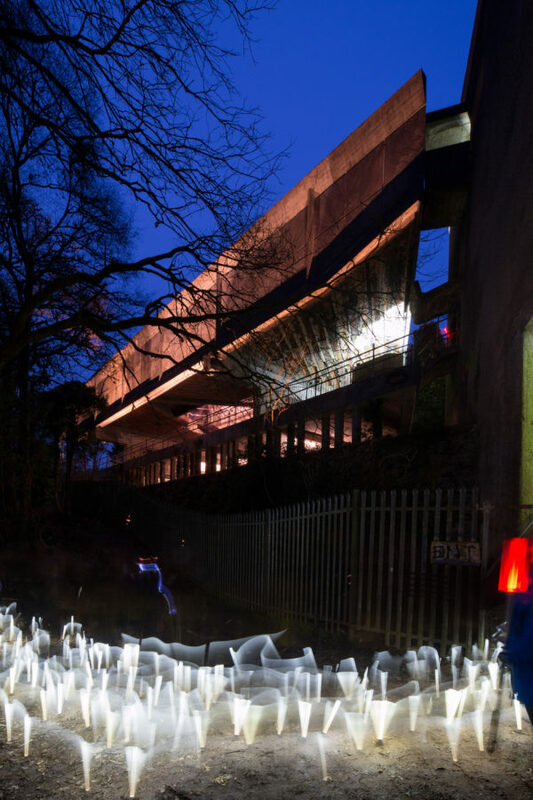 St Peter’s, Cardoss explores and documents both the St Peter’s College (also known as Cardross Seminary) project itself, and the wider architectural and religious movements of which it formed an important symbolic part. It illustrates, in microcosm, the varied character of both Scottish Modern architecture and postwar Scottish Catholicism. And it highlights the conflicting factors within the idea of a Modern religious architecture: the meaning of a religious building, and its ability to communicate with those who worship in it, depend largely on the power, not of newness, but of tradition. The book also traces the way in which religious and architectural change led to the dramatic downfall of the seminary buildings. The extended St Peter’s proved to be an anachronism – a built embodiment of ideals which, even as construction proceeded, were turned upside down by the radical Catholic church reforms of the momentous Second Vatican Council (October 1962–December 1965). Its viability was then further undermined by the mounting economic and social difficulties of the Church in the following years, and, last but not least, by the prolonged troubles of its performance and maintenance. This book, then, records the story of the slow decline of the abandoned seminary, including the demolition of the main building that was its focus; but from the late 1980s, the complex’s fate and reputation was also affected by the beginning of the re-evaluation of Modern architecture as a potential subject of heritage. The seminary ruin then entered into a new life as a heritage artefact, and became increasingly divorced from its own religious and architectural history. The misfortunes of the college highlight today’s conservation quandary, of how to re-use, or even just to maintain, the more spectacular creations of Modern architecture. This preservation-orientated narrative then finally shifts to examine the story behind its transformation into a permanent art installation. Perhaps a secure long-term future is at last in prospect for St Peter’s. St Peter’s, Cardross: Birth, Death and Renewal by Diane M Watters is published by Historic Environment Scotland on November 30 (HB, £30). 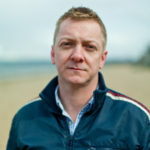 You might also enjoy this additional extract from the book on Books from Scotland here.